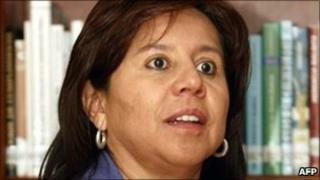 Panama has granted political asylum to the former head of Colombia's secret police, Maria del Pilar Hurtado. The ex-director of the Department of Administrative Security is wanted over illegal wiretapping operations that could implicate Colombia's previous president, Alvaro Uribe. She has already left Colombia - she was not challenged as she passed through DAS-run immigration controls. Panama's move has caused outrage in Colombia. She was granted asylum after "a careful analysis of the request... and the circumstances of reasonable fear for her personal security that prompted her to leave her country", AP quoted the Panamanian foreign ministry as saying. The president of Colombia's Supreme Court, Jaime Arrubla - who was himself a victim of illegal wiretaps by the DAS - expressed surprise at the decision. The concept of political asylum was to "protect those persecuted for their political ideas, not the persecutors", he said. As head of the DAS from 2007-2008, Ms Hurtado was one of the few people who could possibly directly implicate former president, Alvaro Uribe, in the illegal wiretapping of his political opponents and the judges who were seeking to block his actions and re-election prospects. The DAS answers only to the president, but Mr Uribe has denied issuing any orders that violated the law or the constitution. His private secretary, Bernardo Moreno, has already been banned from holding public office as investigations into the wiretapping scandal continue. But no charges have been brought against the former president.